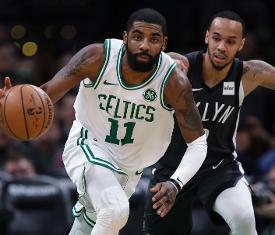 Boston Celtics point guard Kyrie Irving will not play Monday against the Brooklyn Nets due to a right quad contusion. Irving said Monday morning that he would be ready Wednesday against the Milwaukee Bucks. Irving also said the Celtics need to increase their expectations to begin finding consistent success. Boston lost at Orlando on Saturday, 105-103. "We've all got to be of that same mindset -- that it's championship or nothing," Irving said. Marcus Smart (illness) also is unavailable Monday for the Celtics.